BlueParrott Wired Buds are the first in-ear headphones to deliver the many benefits of BlueParrott performance, including unbeatable hi-fi stereo sound, durable design, and convenient inline controls. Given VXi’s reputation for sound quality, it was a natural progression for us to move into the ear bud market. We build products that deliver superior sound, so our Wired Buds are worthy of bearing the BlueParrott name. VXi Corporation announced their latest breakthrough for music lovers and audiophiles, VXi BlueParrott® Wired Buds in-ear headphones. This represents a new product category for the 25-year-old company. VXi brings over a quarter-century of sound quality and wearable technology expertise to the consumer headphone/ear bud arena with their new Wired Buds. For users, that expertise translates into detailed stereo hi-fi sound that brings music to life. Wired Buds’ choice of ear tips delivers custom, long-wearing comfort. In addition, the secure-fitting sport clips provide genuine, reliable stability. VXi BlueParrott Wired Buds also feature a convenient inline control fob/microphone that makes it easy to start/stop music and answer/end phone calls. iOS users can also adjust volume via the inline controls. Like the rest of the BlueParrott family, VXi’s Wired Buds are designed to be real-world tough, with durability features like a braided cord and aluminum housing. 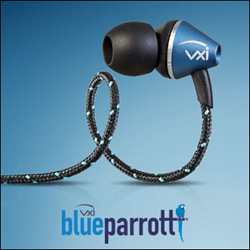 VXi BlueParrott Wired Buds are “Made for iPhone, iPad and iPod,” so they work seamlessly with iOS devices. Of course, they’re an excellent companion for Android devices, as well. And both Android and iOS users are encouraged to download VXi’s free BlueParrott app, to get the most out of their VXi BlueParrott Wired Buds. BlueParrott Buds have an MSRP of $49.99 and are available now on the company’s website and Amazon.com.